Mother’s Day is important for so many reasons. It’s a day to honor everything our mothers do for us and to recognize the sacrifices she’s made. If there ever was a day you want to be perfect for your mom, then Mother’s Day is it. But every year it seems that it’s a challenge to come up with ways to celebrate mom’s big day. This year, we have the answer. 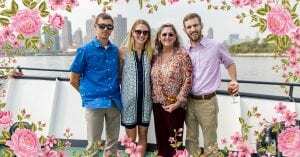 If you’re looking to create that perfect day for your mom, mother in-law, grandmother, or anyone who serves as a maternal figure in your life, you can find it on Skyline’s annual Mother’s Day Cruise. Skyline Cruises’ Mother’s Day Cruise is one of the most popular events we hold all year so book your spots quickly. We offer four-hour brunch or dinner cruises on the East River and New York Harbor. What could be more pleasant than a springtime excursion past some of the most famous sites in the world with the whole family? You’ll see wondrous New York City landmarks starting with our departure from our home port at the World’s Fair Marina, where we always offer free parking. The Marina is located near Flushing Meadows Corona Park, the sight of two World’s Fairs. You’ll pass by La Guardia Airport before enjoying the sights of Manhattan including the Chrysler Building, United Nations, South Street Seaport, and Empire State Building. Our luxury yacht, the Skyline Princess, passes under the famous East River bridges including the Triborough Bridge and Brooklyn Bridge. The trip will be capped by a close-up look at the Statue of Liberty. There is plenty of room for fun on this 3-deck vessel. The Skyline Princess is fully enclosed and climate controlled for your comfort. For Mother’s Day, we will offer either a three-course brunch or dinner buffet which will include several entrees option, salad, potatoes, vegetables, freshly baked rolls, and dessert. Our third level Skylight deck features a DJ and dance floor, so you can dance away with the New York City skyline as your backdrop. The Skyline Princess has viewing decks on all three levels and we offer personalized seating for members of your group. It will be an elegant atmosphere with truly breathtaking sights. You won’t have to worry about a single thing, as the professional staff aboard the Skyline Princess will take care of your every need. We’re proud to create the perfect Mother’s Day experience at Skyline Cruises, and the Skyline Princess is perfect for any occasion. Consider us for your next corporate event or private family celebration. We offer full ship charters from ports throughout the tristate area, including ports in Manhattan, Long Island, New Jersey, Connecticut, and Westchester. For smaller events, we are happy to charter a private deck on one of our public cruises or even offer a table or two. Please note, all of our public cruises leave from the World’s Fair Marina. Skyline Cruises loves to create memorable events. For more information or to book your Mother’s Day brunch or dinner cruise, contact us today.